OTC =/= Over the counter, but it WILL cure what ails ya. The iPhone OS SDK from Apple is wonderful, and being able to develop and debug on-device even without paying the entry tax is even more wonderful. To really take Jailbreak development to the next level, though – to develop Apps that don’t play nicely in Apple’s SDK playground – you are going to need the open tool chain. Here’s how to rock Xcode OTC style.First, what IS the open tool chain? Apple’s SDK gives you a bunch of APIs to work with. For example, there’s CoreLocation, which helps you interface with the GPS, there’s UIKit, which helps you interface with the display and other basic functions, and so on. These are great, and let you write full-featured apps for the platform and all devices running it. They aren’t very deep, though – they don’t let you do things like access hardware directly. They don’t let you do things like modify system code. Moreover, they weren’t publically available before the SDK was released. As a result, a bunch of iPhone hackers, primarily Jay Freeman (also known in various locations, including twitter, as saurik) dumped the headers from iPhoneOS (headers are the things that tell you what classes and methods are available to program with) and fashioned them into a SDK unto itself, usable in much the same way as Apple’s. The difference is that there are hundreds of “Private APIs”, classes not available to the standard SDK users. Many of these APIs allow things like directly controlling the radios, modifying system parameters, and so on. They’re generally super useful if you’re trying to develop something that the regular APIs don’t like, and if you don’t care that your audience will be limited to jailbroken users. Vital Stats: Xcode installed using default settings via the iPhoneOS 3.0 SDK. Cracked to break provisioning profile requirement by the method posted here. unzip -o 30ToolChainTemplates.zip -d "/Developer/Platforms/iPhoneOS.platform/Developer/Library/Xcode/Project Templates"
replace below as appropriate for your network. the iPhone root password, by default, is 'alpine'. and uncomment them (delete the #s). Hint: you can type '/' to 'find' in vi, 'n' to 'find next', 'i' to enter 'insert mode' and esc to exit it. type ':x' to exit and save. From this point on, we should be all set. The only thing left to do is to make sure that you set your phone’s IP in the project settings should it be required. It is worth reading the descriptions of each template when you have the new project window open, too, just so you can be sure you know what’s up. Note: I’ve re-tested this method since reworking the enable-on-device-debugging method of my previous post, and I’ve found that everything is functional, and despite using the open tool chain, debugging is fully functional in all its glory. I haven’t tested Instruments, but I have no reason to assume they don’t work also. As always though, comment if something doesn’t work and I’ll fix it ASAP. so i got think i got it all right from what you said here. i can ping and ssh into phone phine, and thot i know i sent that rsa key with no password. but i get this error when running build script: ‘Permission denied (publickey,password,keyboard-interactive).’ any ideas? The templates seemed to have installed correctly. But when I add the appropriate lines to the “Other C Flags” section of the project properties, and add a private framework that has a line in the header that imports NSObject.h, XCode complains. Not quite sure how to resolve this issue. Hi, I created a project with “Open Toolchain Application” when I finished step 1 and 3, but it failed with such error message – redefinition of ‘_mm_max_pi16’. Could anyone give me a help? Thanks a lot! Hi, Thank you for the tutorial. For some reason the templates are not showing up in XCode. My “unzip -o 30ToolChainTemplates.zip -d” line failed to create a directory so I made one myself and added the files from the zip archive. Hi, The solution to my earlier problems was that I did not have the iPhone 3.0 SDK installed. Easy fix. Has anyone has luck resolving this issue (probably a simple fix) Thanks! I just upgraded to SL, so am wondering if anyone knows if this works on xcode 3.2? May be Joe and Pope are able to fix this..
Any idea if this works with Snow Leopard? I’ve tried and every time I build anything, I get ~17,000 errors. I DO have the 10.4 SDK installed (installed Xcode 3.0 as well as Xcode 3.2.1). When configuring, I did specify the 10.4 SDK directory as well. 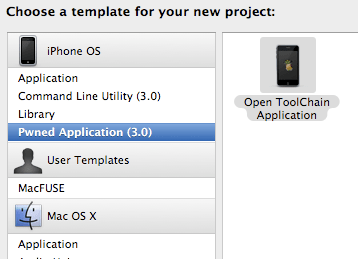 Is it possible to use the open toolchain in XCode 4 and iOS 5? I’m not targetting the iOS 5 specifically, but I just bought a Mac mini and it comes with Lion, so I can’t use a previous version of XCode. http://shoestoremall.com I just upgraded to SL, so am wondering if anyone knows if this works on xcode 3.2?